After his summit with dictator Kim Jong-un on Tuesday, President Trump indicated the North Koreans are dismantling another facility important to their development of nuclear missiles following the purported shutdown of the Punggye-ri nuclear bomb testing site. Analysts believe this was a reference to the missile engine testing site at Kusong, which appears to be undergoing demolition based on satellite imagery. North Korean watchdog site 38 North reported last week that the Iha-ri Driver Training and Test Facility, as it is formally known, was the only known facility for testing the launch system for Pyongyang’s latest generation of land-based long-range ballistic missiles. The launch canister and ejection system is an essential component of mobile missile systems, providing the ability to prep and launch the enormous missiles quickly. North Korea was also working on solid-fuel rocket engines, which can be launched more quickly and transported more easily than liquid-fueled missiles. The idea is for the launcher to propel its missile high into the air, where the solid-fuel engine can “cold start” and blast higher into the atmosphere. This process is much more difficult to detect, or target with a preemptive strike, than the older method of pumping liquid fuel into missiles before launch. According to 38 North, the Iha-ri facility became part of North Korea’s Pukguksong-2 missile program in February 2017. Construction of the test stand took about eight months. 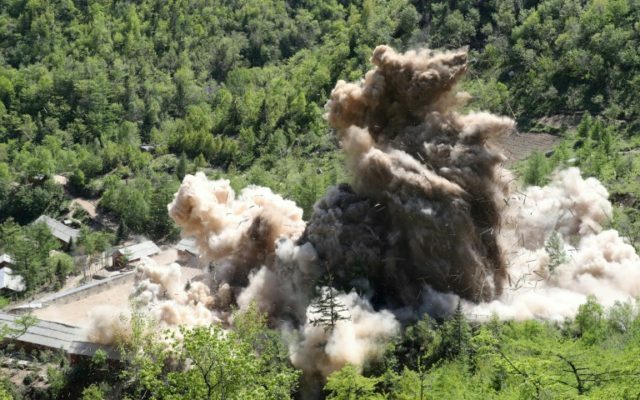 Based on satellite images, demolition began in May, a few weeks after Kim Jong-un announced the suspension of ballistic missile and nuclear testing. There is no visible indication that a new test stand will be constructed to replace the demolished structure. The New York Times noted soon after 38 North published its analysis that some other experts dispute the importance of the Kusong facility, pointing out that a successful Pukguksong-2 test launch was conducted from a different site last May, in addition to an evidently unsuccessful launch in April. Furthermore, the most dangerous long-range missile in the North Korean arsenal, the Hwasong ICBM, is liquid-fueled so its further development would not rely upon the facility that appears to have been demolished. CBS News reported on Monday that U.S. intelligence agencies wish to inspect roughly 100 sites to verify that North Korea’s nuclear and ballistic missile research programs have been fully shut down. The last time a comparable inspections regime was implemented, during the George W. Bush administration, the inspectors accused North Korea of cheating on its denuclearization promises and were kicked out of the country in retaliation.